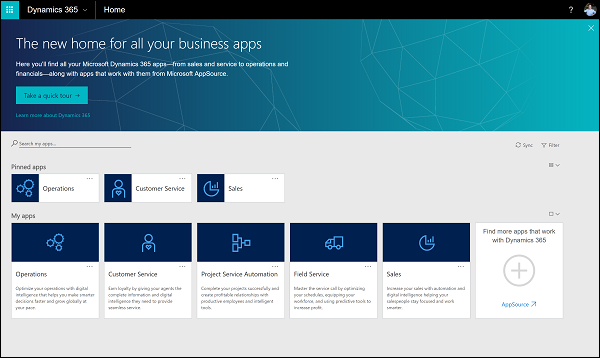 Dynamics 365 for Customer Engagement introduces a new app model for Customer Engagement apps and makes accessing these and Office 365 apps fast and easy. If you're a Customer Engagement apps user with an Office 365 subscription, you're just two clicks away from accessing the family of online apps that are available to you, like Word and Excel Online. 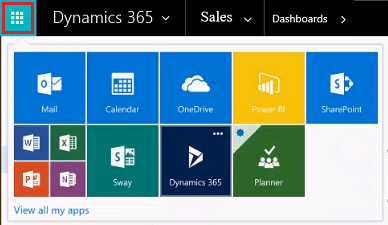 Watch a short video (3:35) about the Dynamics 365 for Customer Engagement apps business apps. The Office 365 app launcher is built in to all Dynamics and Office 365 apps. Use the app launcher to quickly navigate to your Dynamics application of choice. If you have an Office 365 subscription, click the app launcher to go to the Office 365 apps and services available to you. Check your email. Create a Word doc. Get files from your OneDrive. All while staying just two clicks away from getting back to Customer Engagement apps. TIP: If you've just started a trial or upgraded to Customer Engagement, you might need to refresh or open a new browser session to see your apps. There might be a delay for your instance to fully provision. 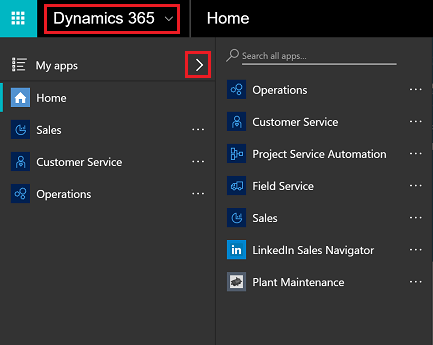 For Microsoft Dynamics 365 US Government subscriptions, the Office 365 app launcher will take users to either Dynamics 365 for Customer Engagement apps or the Dynamics 365 admin center. Admins will go to the Dynamics 365 admin center. If you're a Customer Engagement system administrator or an Office 365 global administrator, click the app launcher to see the Admin tile. 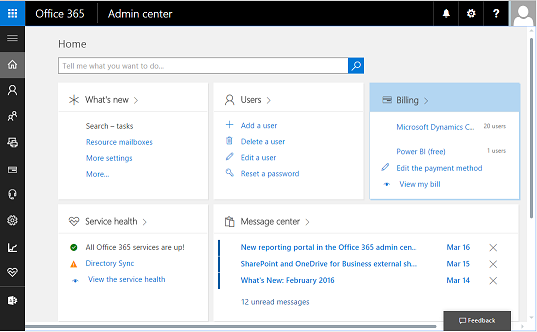 Click the Admin tile to go to the Microsoft 365 admin center, where you can add users and change passwords. 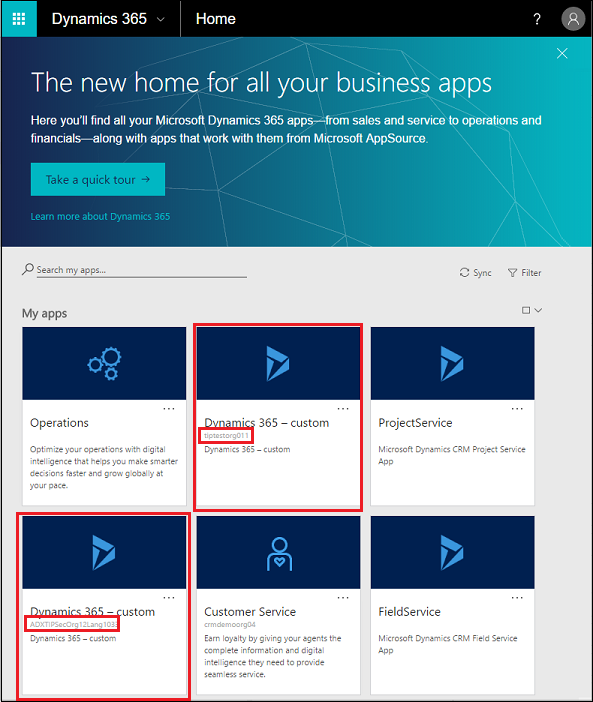 If you've transitioned to December 2016 Update for Dynamics 365 (online), we have a new page for you to manage and open Customer Engagement apps. Click Customer Engagementfrom the app launcher, to go to the Customer Engagement home page (home.dynamics.com). The new Customer Engagement home page. The Customer Engagement home page is not part of the Microsoft Dynamics 365 US Government subscription. Clicking Customer Engagement takes Microsoft Dynamics 365 US Government users to your instance of Dynamics 365 for Customer Engagement or to the Dynamics 365 admin center. See the next section to see what you can do with the home page. Any Customer Engagement app for which you have a license appears as an app module tile on this page. If you have multiple instances of an app, select the tile for the instance you want to open. In this example, there are two instances of Dynamics 365 for Customer Engagement displayed. If you've just started a trial or upgraded to Customer Engagement, you might need to refresh or open a new browser session to see your apps. There might be a delay for your instance to fully provision. 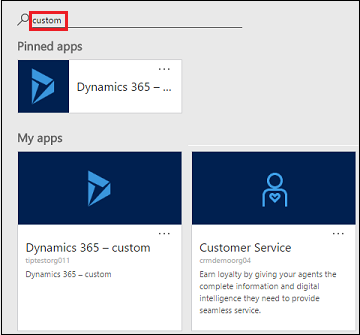 What is "Dynamics 365 - custom"? 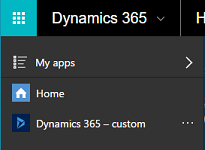 "Dynamics 365 - custom" is the app name for all online organizations with a version 8.1 and lower as well as the default app on 8.2. The name for the 8.2 default app can be changed by the administrator. What are the tiles on the home page? Customer Engagement is introducing a new app model and what you're seeing are Dynamics 365 for Customer Engagement apps for which you're licensed once you've upgraded to December 2016 Update for Dynamics 365 (online). Admins: You have options for displaying and naming Dynamics 365 - custom. Once you update to December 2016 Update for Dynamics 365 (online), you have options. Go to Settings > Administration > System Setting > General tab. Scroll down to Set options for the default app: Dynamics 365 - custom. Where do I get more information about upgrading to Dynamics 365 for Customer Engagement? For companies with lots of Customer Engagement apps, you can do a variety of things to make the home page more manageable. For example, pin your frequently-used apps to the top of your page. Select the app on the home page. Click the ellipses (...), and then click Pin this app. The app will appear at the top of the home page and in the task pane. Pinned in the home page. Pinned in the task pane. If you have a lot of apps, you can search for specific ones. For customers who have upgraded to December 2016 Update for Dynamics 365 (online) or later, you can use the app switcher in Dynamics 365 for Customer Engagement to quickly select other Customer Engagement apps for which you're licensed. You can pin apps using the ellipses on this menu, which will pin to the menu and to the home page.